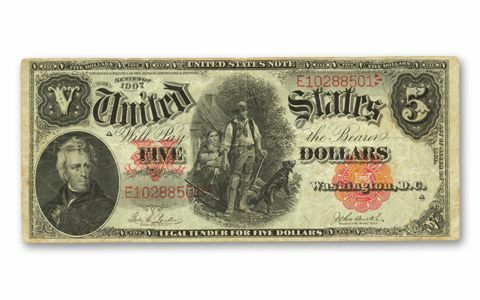 When this $5 Legal Tender Note was issued in 1907, the memory of the American pioneer building a log cabin with just his ax and elbow grease was still vivid in the collective consciousness. And, maybe that's why he was chosen to be honored on this note, which quickly was labeled "the Woodchopper." 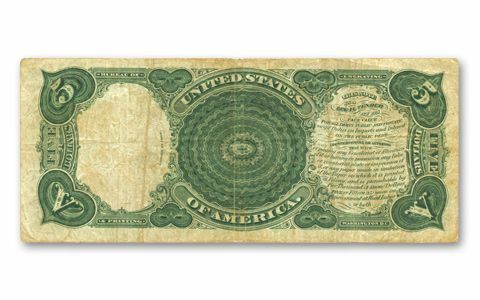 The intricately engraved vignette is the central feature of the note, which also shows an engraving of Andrew Jackson. A bold red "V," the treasury seal and the serial number make this note a real work of art. The reverse features an ornate decorative pattern in green. It's also the last $5 "Horse Blanket" note, so named because of its large size - it wouldn't fit in your wallet (but don't try it)! 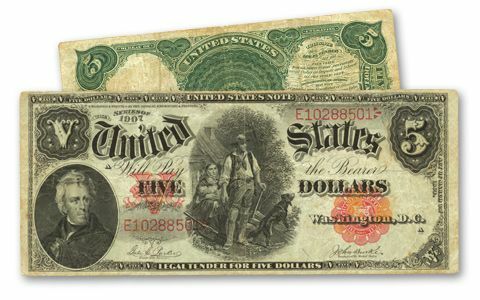 Over the years, collectors have made this note one of the most popular currency issues of all time. You can get yours here in Fine condition and save money when you do-it sells elsewhere in a lower grade for 50% more. Hurry, as you can imagine, our supply is extremely limited.